That's excellent, and greatly narrows down the problem. I think I already know what it is, but it would really help if you could send screenshots of the two items details. If we can reproduce the problem with 100% (or close) the bug is as good as fixed. - Fixed a serious bug where the hero could get stuck after defeating a boss on some computers. 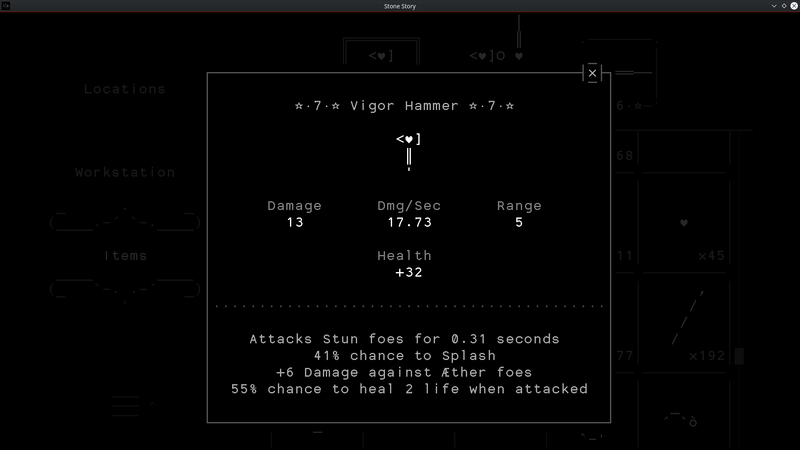 - Fixed a problem where a hammer with Splash would hit many enemies at the same time and cause a huge camera shake. - Fixed a bug where the top row was being drawn black in the Pallas fight. - Small fix so the AI doesn't keep track of the last harvest tool used if there is nothing to harvest. - Diagnostic strings now break into lines to fit the screen width. - Workstation task completion dialogs can now be skipped with Enter or Spacebar. - Fixed a bug in the inventory screen where selecting an item then pressing on the scroll bar could sometimes cause the selection border to float in place. - Fixed a bug where the pause button would appear momentarily at the beginning of the game or after restarting progress. - Fixed a huge CPU spike when pressing +/- buttons on the Anvil if you have a large inventory. Please let me know if it's fixed when you have a chance to test. The getting stuck bug I mean. We can do ultra-camera-shake purposefully if some people think it's cool. Could be part of a special ability. Though, the game already looks stunning, so I don't know that you'd even need that. Animated the Crusader's Compound Shield. - Basic shield has been reworked with a new Armor mechanic. - Minor improvement to the Snail walk animations. - Adjusted Ant distribution in the Antfestation location. - Buffed small Bat hitpoints from 6 to 7. - Nerfed Angry Shroom melee attack cooldown by 3.5 seconds so it doesn't punish melee loadouts. - Buffed Angry Shroom range attack from 16 to 18. - Buffed Angry Shroom ☆3 punch damage from 2 to 4 and move speed by 3. - Buffed Angry Shroom ☆4 punch damage from 3 to 5 and it shoots 5 instead of 4 projectiles. - Snails and Angry Shroom have been changed to use armor. - Buffed Bolesh ☆5: Hitpoints from 300 to 350; Reduced her Claw cooldown from 67 to 60. - Ouroboros healing period has been increased from 5 to 6.28 seconds. - Buffed duration of Poison damage debuff from 2 to 3 seconds. - Nerfed elemental damage on weapons that have passive abilities. - Buffed elemental damage on weapons that do not have abilities. - Buffed Pallas ☆3: Damage from 7 to 8; Hitpoints from 300 to 460; Attack cast -0.5 seconds; Attack recovery -2 seconds. - Buffed Pallas ☆4: Damage from 7 to 9; Hitpoints from 400 to 500. - Buffed Pallas ☆5: Damage from 8 to 10. Known issue: The item ability "+X Armor against <Element>" currently does nothing and will appear as "[missing ability]". Soon to be replaced with something else. A similar ability will be added in its place. Waiting for more feedback on the new Armor system. - Swapped order of "Leave" and "Items" buttons in the pause menu. - VSync is now OFF by default for Linux builds and that setting is saved between play sessions. - Replaced Bladed Shield for Crusader's Shield in the credits screen. - Added camera shake to the Bronze Guardian in the credits screen. - Adjusted Discord message in the credits screen. - Fixed a bug with the Sight Stone where, if you swapped items just as the screen flashed white, it would stay white permanently until the Sight Stone was used again. - Fixed a minor bug with rendering the main character after picking up the XP Stone. > - VSync is now OFF by default for Linux builds and that setting is saved between play sessions. When I come home from work I will try if this fixes the perf bug! - Minor change to attack collisions so they hit the nearest enemy instead of the oldest. - Adjusted position of Snail and Ant Hill in last screen of Mushroom Forest ☆3 before the boss. - Nerfed Ants by removing their critical damage. - Reduced damage on Big A.. Snail from 4 to 3. - Nerfed Angry Shroom ☆3: Punch damage from 4 to 3; Punch cooldown increased by 0.5s; Hitpoints from 50 to 30. - Buffed Shield base armor by 1. 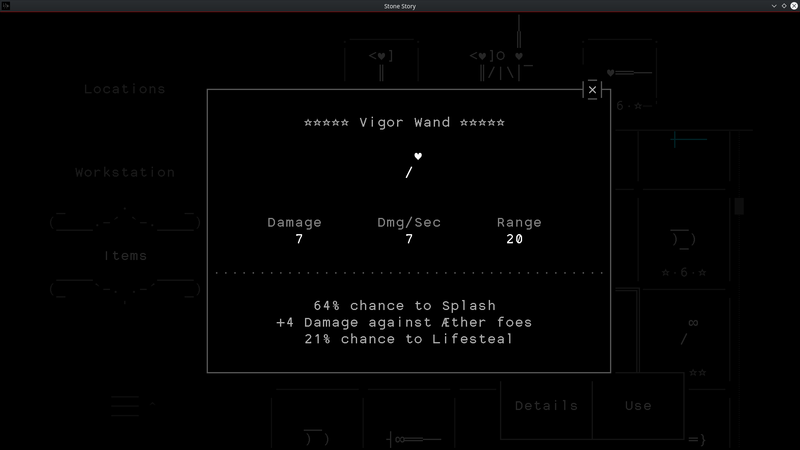 - Fixed a bug where the player's armor was not being considered when calculating lethal damage, resulting in occasional death when you shouldn't have died. Oh yea, I will be in the Indie Megabooth this year. 10'x10'. If you're going to attend stop by to say hello.